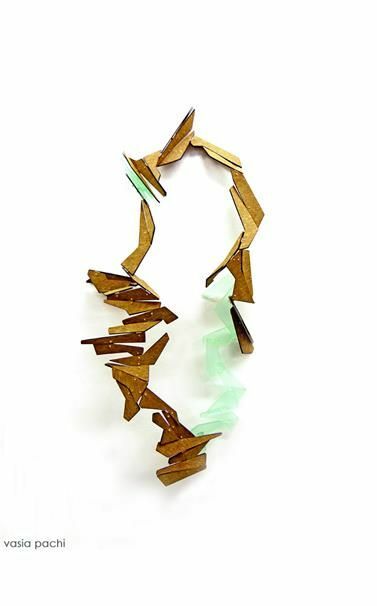 Sofia Zarari - « Antilogos II » Necklace. Silver, plastic, textile, quartz, agate, calcite, aegirine, jasper. Spells and incantations, amulets and fetishes, ex-votos and tamata – words, gestures, objects that tell of a need as old as the human race itself: to thwart evil and protect life, a need that is every bit as strong today as it was for our ancestors since time immemorial. 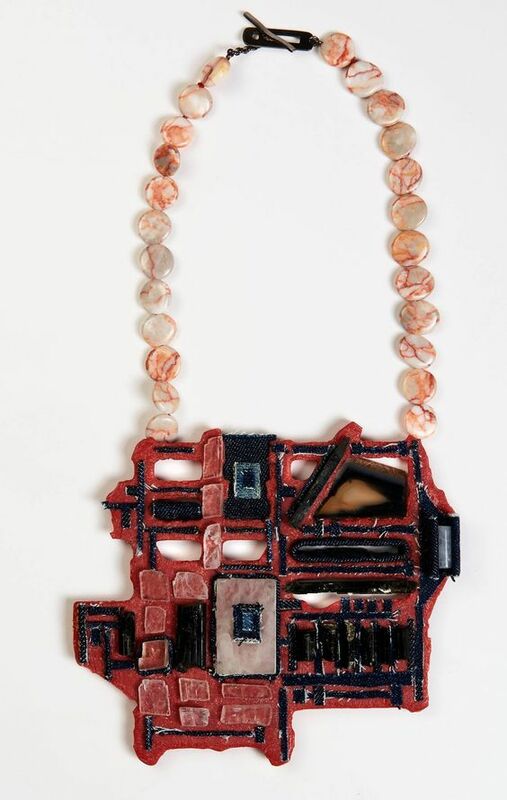 El.Marneri Gallery invites artists to participate in building a collection of jewelry and art objects that revisits the age-old notion of the protective charm. One-of-a-kind or limited edition objects tap the ancient tradition of apotropaic symbols; they revise it, reinvent it, comment on it. The collection – that is to be permanent and exclusive to the Gallery – will constitute a work in progress that is to evolve through the addition of both participating artists and new acquisitions. The project is to be completed in a year’s time and will be launched at a special event held at the Gallery this coming Christmas. 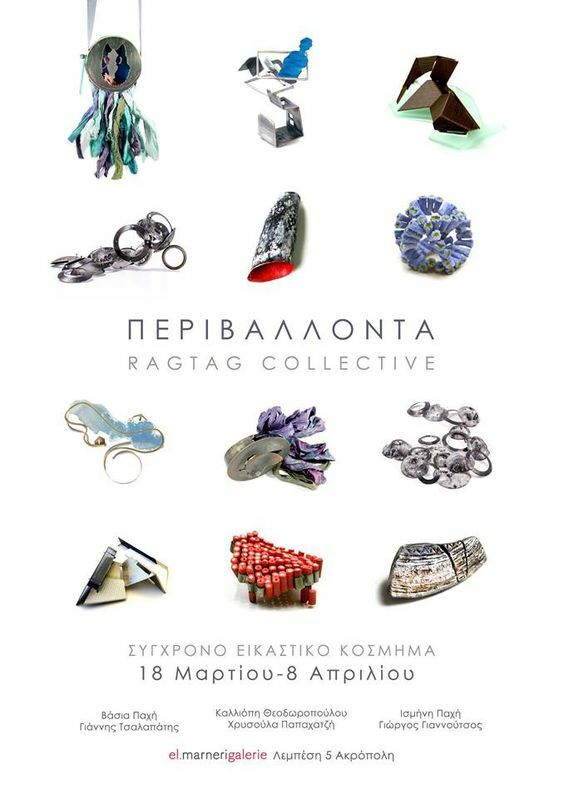 Sophia Zarari — Mari Aoyama — Tatiana Choremi — Katerina Anastasiou — Marigo Kassi — Lina Moisidou — ΠΟΤΝΙΑDesign — Stavroula Kaziale — Aliki n’ the Jaz rabbit — Maria Tsimpiskaki – Anna Theocharaki — Ioli Livada – Rallou Katsari — Anna Vlahos — Aliki Stroumpouli — Maro Vasiliadou — Xrysa Chatzikostantinidou — Kyriaki Panagi — Eyaggelia Dimitriou — Danai Gianelli — Paula Lakah — Voula Karampatzaki — Yiannis Siotis – Katerina Giannaka — Dimitris Korovesis. 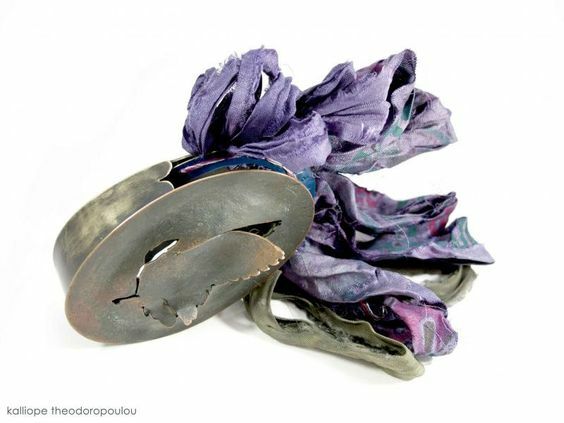 Inner Core contemporary jewellery collection by the artist Zeta Tsermou. 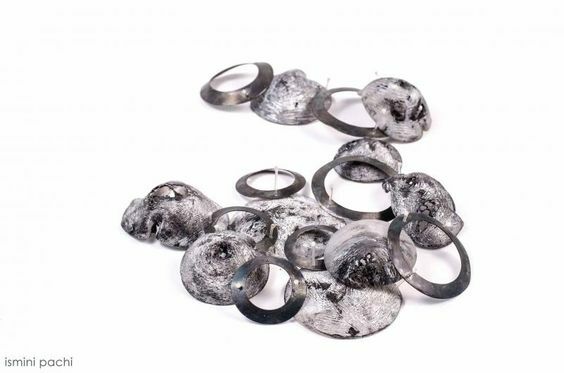 Gallery el.Marneri presents the contemporary jewellery collection Inner core by Zeta Tsermou. 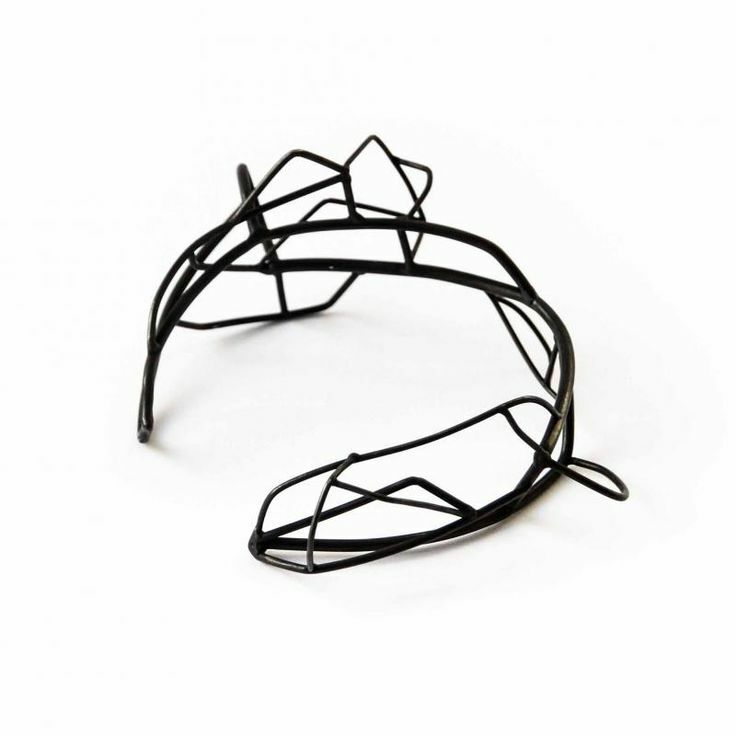 Inspired by architecture this collection exposes the inner core of the jewellery piece free of its outer shell. The revealed core is the heart of the piece. The core can be rough, the core defines the shape, the core is where the essence of beauty is hidden. The piece of jewellery then turns into an exoskeleton or an armour to “protect” the body that wears it. 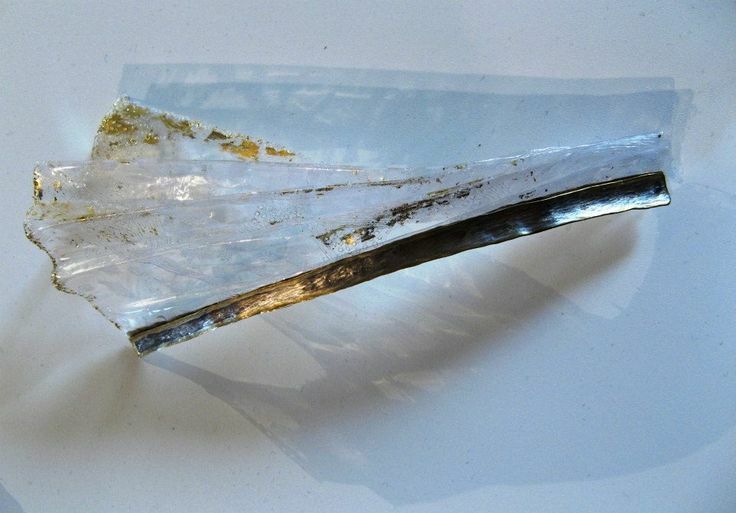 Other times it can become almost weightless, wrapped or folded in order to create fluid forms. Zeta Tsermou was born in Athens, 1972. She studied architecture in the National Technical University of Athens, then got a Masters degree (MArch) in the Bartlett School of Architecture of UCL in London. She worked as an architect in London and Athensand also taught architectural design in Portsmouth School of Architecture.Later she studied sculpture in the School of Fine Arts in Athens.Micro sculpture soon led to experimentations with jewellery and sheattended various workshops and seminars in jewellery making: in Athens with Dimitris Nikolaidis and in London with Paul Wells and Anastasia Young in Central St. Martins.Now she works as an artist and jewellery maker in her studio in Athens. 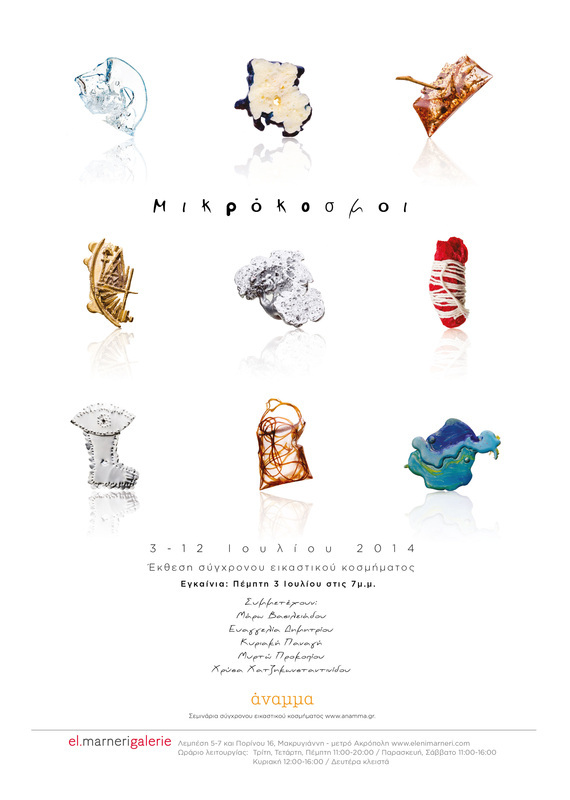 Contemporary Jewellery Exhibition travelled in Japan, afterwards in Taiwan and now IN GREECE!!!!! 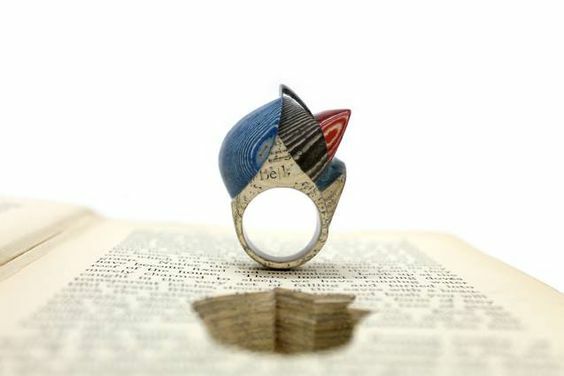 12 jewellery designers from all over the world!! Twelve artists, with different backgrounds, from 6 countries, came together to think about the basic question: “where is the world going?” We chose the name of the exhibition, CURRENT, to mean not only the flow of ideas but also what’s happening in the world now. 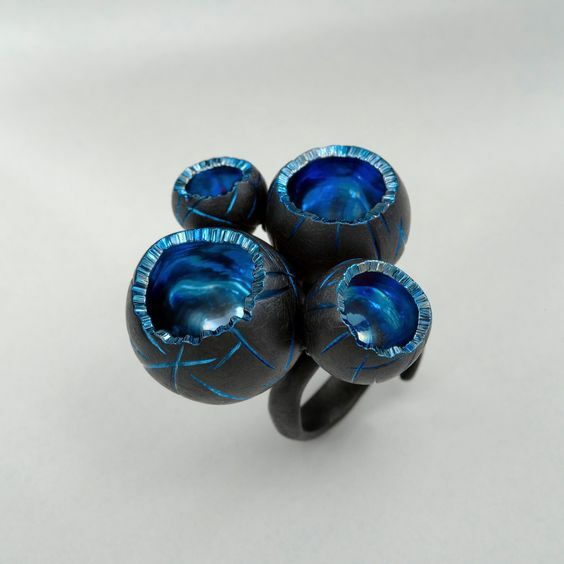 Both those concepts are intended to be expressed through jewellery. 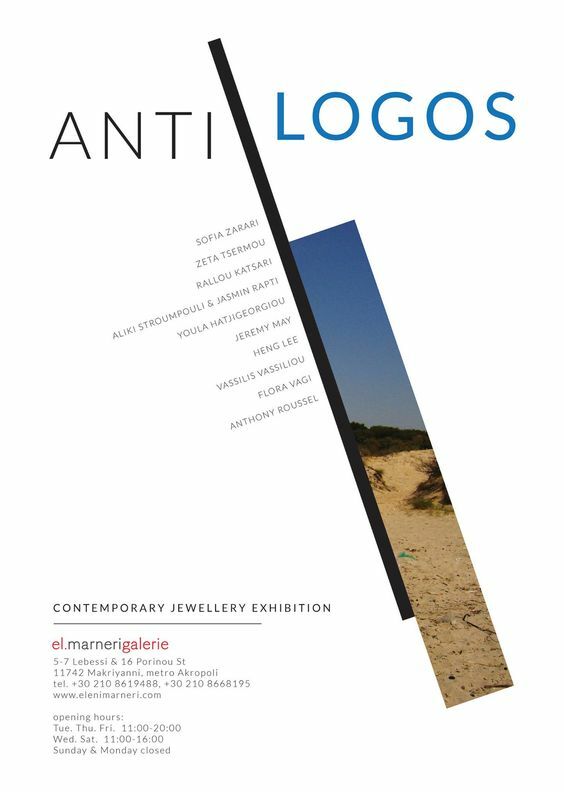 Artists: Rudee Tancharoen (Thailand) — Manolya Konuk (France) – Elisa Deval (Italy) – Maria Constanza Ochoa (Colombia) — Rallou Katsari (Greece) — Poly Nikolopoulou (Greece) – Meiri Ishida (Japan) — Karin Kato (Japan) — Yoriko Mitsuhashi (Japan) – Yoko Shimizu (Japan) – Yuki Sumiya (Japan) – Janny Huang Yokota. 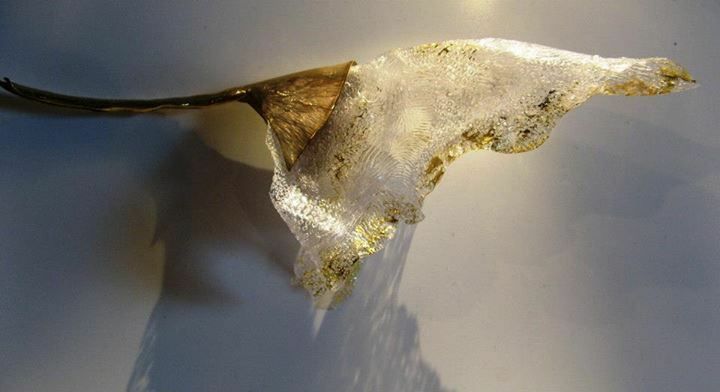 Maria Tsimpiskaki - Erosion – brooch – PVC, sterling silver or brass, 22Κ gold foil, pigment. « How social degradation meets natural erosion? Are we globally facing a self-destructive tendency or are we just a part of the universal entropy? 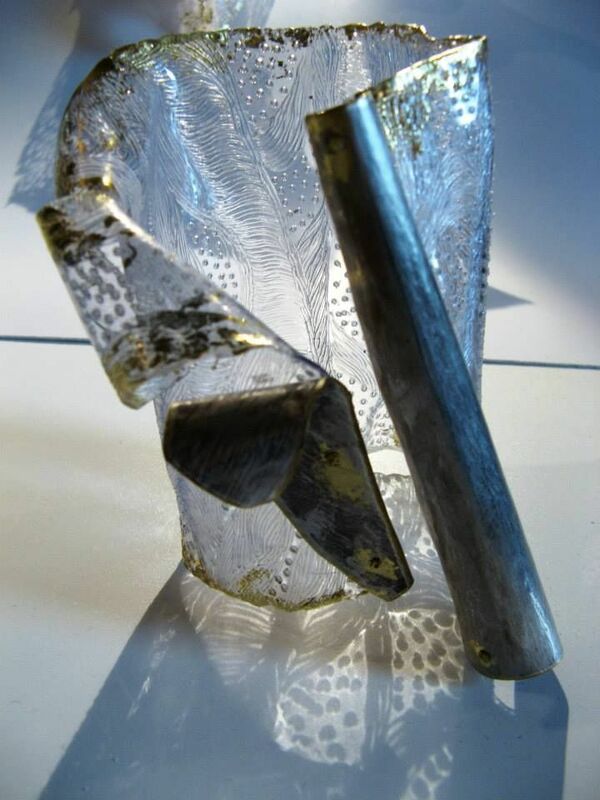 Maria Tsimpiskaki – « erosion » bracelet 2013 – PVC, sterling silver or brass, 22Κ gold foil. 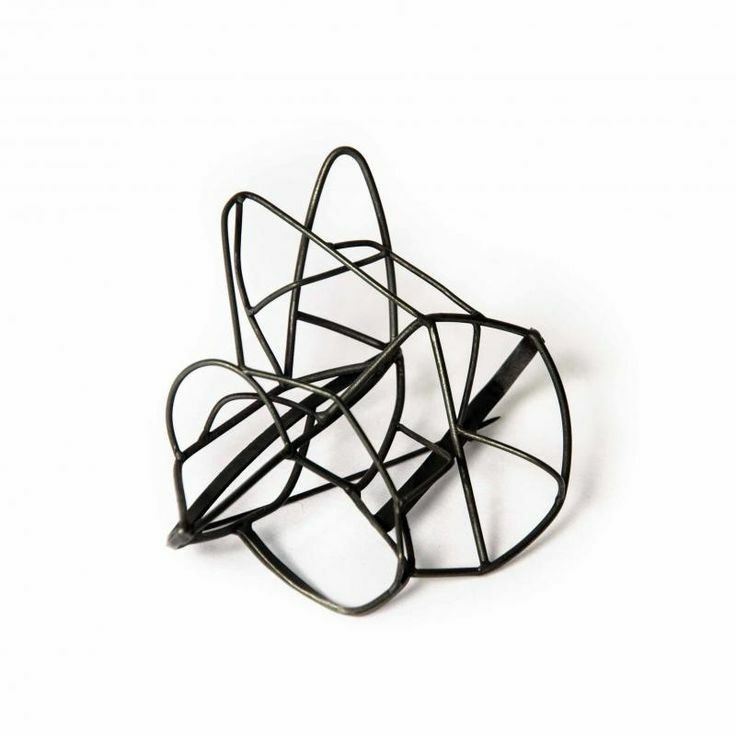 Erosion – Brooch – PVC, sterling silver or brass, 22Κ gold foil.